Eco-friendly families, businesses and community groups were recognised at the Peterborough Telegraph’s annual Green Awards this week. The Green Awards 2015, held at the town hall in Peterborough and organised by the Peterborough Telegraph and PECT (Peterborough Environment City Trust), was one of the best supported since the awards began. Nominations flooded in for groups, businesses, charities and individuals who champion the environment and try to limit damage to the environment in everything they do. The panel of judges, chaired by PECT chief executive Carly Leonard and Ken McKay, Honorary Patron of Peterborough Environment City Trust; Councillor Nigel North, Peterborough City Council Cabinet Member for Communities and Environment Capital, Nyree Ambarchian, Associate Director at Stand Agency and Iain Crighton, President of the Cambridgeshire Chambers of Commerce and Chairman of the Peterborough Chamber of Commerce was impressed with the standard of entries. The awards ceremony on Monday night was supported by headline sponsor Prince Energy. Prize sponsors IKEA and Tesco, category sponsors: Cross Keys Homes, Big Web Warehouse, Queensgate, Amey, Hunt & Coombes, McCain, and Peterborough City Council. The event was hosted by PECT chief executive Carly Leonard , who said: “This unique event helps to celebrate and raise awareness of the achievements of individuals, businesses, schools and community groups across the city and surrounding areas. Judges were looking for a family who made a real difference to the environment by championing sustainable living practices within the household. The category winner was the Middleton Family. Stuart, Clare and their daughter Emma are described as obsessive recyclers. They buy their food from the local Green Backyard shop and Approved Food, which sells produce that is past the best before date and so would otherwise have gone to waste. They are a single car household and limit the use of this with public transport and by walking and all three members of the family volunteer for The Green Backyard. This award covered anything from an allotment, community garden or public park with nominees asked to show how the space demonstrated sustainability. The runners up were, Itter Park and the Green Backyard. The category was won by The Thorpe Gate River Care group. The group believes that the River Nene is one of Peterborough’s finest and yet most under-appreciated assets and it has worked tirelessly to protect the local river environment and its wildlife and to promote a sense of community. The runners up were Ricky Caywood from the Wildlife Haven Project at Railworld, Peter Reynolds a committed volunteer with Greeniversity, Gordon Pearson organiser of Parkrun, John Turner from Fairtrade Peterborough, Tim Devonshire from Rivercare and the Green Backyard. The category winners were the Glinton & Peakirk Green Community Group. This group is driven by a commitment to ensure that the villages are at the forefront of positive environmental change. Set up in 2012 the group, with the support of Peterborough City Council, raises awareness of environmental issues, promotes behaviour change, monitors emissions by creating a whole community carbon footprint, and delivers carbon reduction investment. This award recognises the achievements of a local hotel, restaurant, café, pub, food retailer, or producer in Peterborough who has made a concerted effort to reduce the impact on the environment of the service they provide. The winner was Riverford Farm. Riverford Farm delivers organic veg boxes to homes all over the city. When Riverford took over management of the farm they put in the work to create an organic, wildlife friendly farm. Recent initiatives include planting an apple orchard, wildflower meadow planting, and carrying out a biodiversity survey. The runners-up were: John McGinn at the Dog in a Doublet pub, Matt Bedford at Fishtastic and Samantha Bateman at Clarke’s Cafe. This award was open to any size of tourism enterprise, urban or rural, which is actively engaged in promoting sustainability and reducing the negative environmental or social impacts of their operation. The runners up were Best Western Orton Hall Hoteland Thomas Cook. The winner was Flag Fen. Flag Fen Archaeology Park is situated on the edge of Peterborough, offering a tranquil haven for visitors and wildlife. The site has been carefully managed to protect the hidden archaeology and to interpret the story of Peterborough’s ancient past. Such sensitive management of Flag Fen has benefited many species of animals, plants and insects. Today the site boasts wetland, reed beds, woodland, hedgerows, fenland and grassland. At the site’s recent Bioblitz event 190 wildlife species were identified, including a thriving population of rare black Water Voles along with otters, barn owls, a pair of Peregrine falcons and kingfishers. This category was for thriving youth groups or after school clubs with strong environmental credentials. 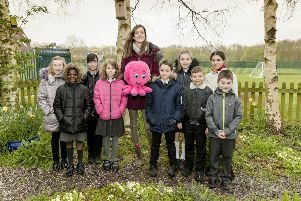 The runners-up were Ormiston Bushfield Academy Eco Club, Nene Park Academy pond creation group, Thorpe Primary School Eco Club and the Werrington Primary Eco Team. The category winner was Emma Herbert. Emma has set up a Young Environmentally Minded Group called Home Educated Haven Explorers. All the children have special needs and all the children have a great love and fascination for nature and the environment. The group met initially every Tuesday, but such has been its success it plans to meet on Thursdays as well. These awards were given to businesses nominated by readers or employees who have shown an excellent record in promoting environmental issues. The first award went to McCain. Judges said: “At McCain, good business practice and operational efficiency go hand-in-hand with environmental sustainability. They understand the benefits of being a responsible custodian of the environment from farm to fork, and their local plant is regarded as a flagship site for sustainability among the global network of McCain businesses. A second Exemplar Award went to Larkfleet Group. Judges said: “Larkfleet Group is an award-winning house building and development company. Runners up were Peterborough Reuse. When Brainwave Innovations posted a challenge by Peterborough based international coffee manufacturer Masteroast of how to divert large quantities of coffee sacks from landfill, a solution posted by Pav Patel and Gary Graves not only solved this challenge but also led to the idea behind Peterborough Reuse. The innovative business model behind Peterborough Re-use repurposes these hessian bags: whether that’s as mulch for use in tree planting, riverbank reinforcement as part of flood protection schemes, a range of textile products such as shopping bags or even as Christmas decorations. As a result of their efforts, Peterborough Reuse save approximately 40,000 sacks from going to landfill a year, are a great example of circular economy in action and support Peterborough’s drive towards long-term sustainability. Joint winners were the The Green Backyard and Peterborough Highway/Skanska. The Green Backyard makes a significant contribution to many of the Environment Capital principles. It has solar power and rain water harvesting systems operating on site.The composting system composts all green and brown material. It one of the most accessible green spaces in the city, the site is served by 12 bus routes and is just a 5 minute walk from the train station and city centre. In 2012 a survey found that over 95% of visitors reported a significant improvement in their physical and mental health as a result of spending time at the GBY. They run a huge range of events that are designed to bring people together, uniting communities and celebrating the myriad of cultures present in our city. In 2013, Peterborough Highway entered into a 10 year partnership with Peterborough City Council for the provision of the city’s highways maintenance services. Adopting a ground breaking approach during the procurement of this contract, the council challenged bidders to specify how they would deliver against each of the 10 principles of Environment Capital throughout the contract. Skanska demonstrated a clear commitment to Peterborough’s Environment Capital aspiration and since successfully winning the contract they have put this commitment into practice.